I’m trying to get these out as quickly as I can! I know they are relevant right now, but bear with me. Just one more post after this one will finish them up. Thanks for the feedback and additions on the previous posts, I appreciate them. Remember if you have any tips I’ve forgotten or just haven’t thought of, please leave them in a comment! 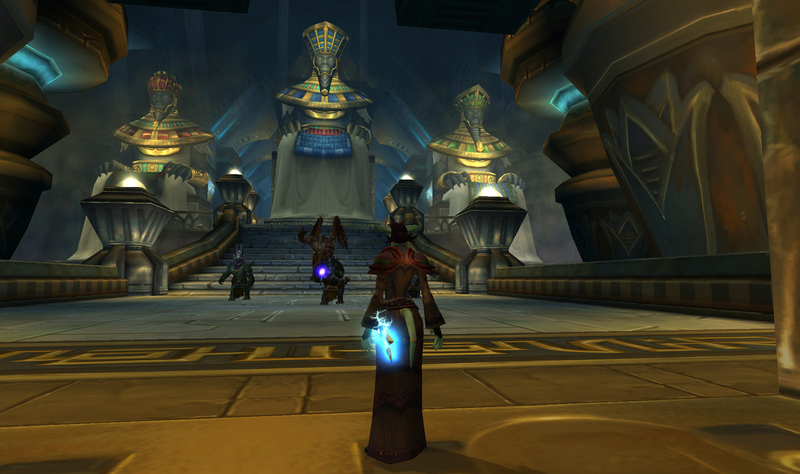 This is part three in a series of mage-specific heroic Cataclysm instance guides. This part deals with only Halls of Origination and Lost City of the Tol’Vir. Part one includes some basic instancing strategies, as well as tips for Blackrock Caverns and Throne of the Tides. You can find it here. Part two covers The Stonecore, Vortex Pinnacle, and Grim Batol and is located here. These are not the full strategy guides for each instance – only mage-things that may prove useful. This guide assumes that you are familiar with the basic strategy for each encounter. For instance cheat sheets, you can check out the guides a guildie of mine wrote over at Sword and Board. See the one waving his hands in the back? You want what he's having. Trash: You can spellsteal Molten Barrier from the Temple Fireshapers – it increases your spell haste by 50% and also randomly shoots fireballs at nearby targets. Try to be careful where you’re standing once you have this – it can and will break CC. It’s still preferable for you to have it, and not the Temple Fireshaper. Most of the bosses in HoO can be done in any order, with the exception of Ptah who is only available after Anhuur is killed. Keep in mind that your group may be doing them in a different order than you expect, but you can use Time Warp on one of the last four bosses and have it ready to go by the time you reach the last. I like to use it for Setesh, and then Rajh. There are four elemental “mini-bosses” that primarily do things you don’t want to stand in. You can slowfall yourself, your partner or both – it’s up to you. I slowfall down and drop a Blast Wave as I’m falling. The snakes hit hard. AoE them and keep them from your partner however you can – to give you both some lead time, you can Frost Nova them and run up the stairs at the end of the phase. You can also put RoF on the stairs or the landing to buy you both some time, if you position well it can be pretty useful. Using Time Warp any time before the end of the fight isn’t necessarily very helpful; since he shields at percentages of his health, you’ll only force his next shield phase sooner. I save it for immediately following the second shield phase. Make sure to find yourself a camel before this fight! Besides being kind of neat looking (with an entirely implausible jump animation) the camel allows you to cast and move simultaneously. I find that sprinting in circles while avoiding dust clouds, spikes and whirlwind all while cackling madly and flinging fireballs is fun – but not strictly necessary for success. Your task here is to simply DPS him before your healer and tank get overwhelmed by AoE and damage. Accordingly, if Time Warp is available it’s a solid choice to use it for this fight. Much like Eadric from ToC, use your mouse’s right button to quickly spin and face away right before she finishes casting Supernova. You can and should spellsteal Veil of Sky from her – it protects from all damage but drains mana instead, much like Mana Shield. The purpose here is to take it from her, not that it’ll necessarily do much for you. Blink away from her laser beams and kill adds. Make sure that you know which of her three aspects your party will be focusing on, especially if you don’t have Ventrilo or similar. Burn down the specified targets, and that’s it! Fire/Frostfire Orb is good to save a few seconds into the fight – if it’s up, it can help you to target spawning seed pods. You can also adapt a macro for this purpose: “/target Seedling Pod” will do it. If this is done right, you shouldn’t ever see a Bloodpetal Blossom, but he will spawn Spores regardless. Kill the spores and don’t stand in the gunk they drop. If for some reason a Bloodpetal was able to spawn, they can be killed by kiting/standing them in this residue. Interrupt Wither if you see him casting it. This boss is fun, because the tank isn’t really tanking him. Hit it like you mean it! The biggest thing you have to worry about is attacking his Chaos Portals as soon as possible. If you’re familiar with Lord Jarraxus in ToC, it’s the same thing. Burn them down. Your target macro from Ammunae, re-purposed to “/target Chaos Portal” will serve you well here. When he casts Seed of Chaos, it puts little purple bubbles on the ground. Being in them will hurt you, but also increase your damage output. Don’t overdo it if your healer is struggling, but the buff will help end the fight more quickly. As mentioned above, I like to use Time Warp on this fight. Any time is fine. Any time spent killing adds is wasted time, but you can attempt to use slowing abilities to help your tank if he/she is kiting them. By the end of the fight this can get pretty hectic with adds and explosions and void zones all over the place, so just remember to keep attacking portals, attack Setesh when you can and make it all end quickly. First of all, Rajh’s trash has a spellstealable ability. I’m going counter to everything else in these guides by saying: Do not steal it. The tooltip says that it increases fire damage by 75%. It lies. This ability is currently bugged, and will instead do the exact opposite, decreasing your fire damage by 75%. It also stacks, so it’s possible if you steal this to reduce your damage to next to nothing (if you’re a fire mage). This fight is all about interrupts, and you have one! Use it to interrupt his Inferno Leap and Summon Sun Orb. Save your cooldowns for when he’s casting Blessing of the Sun (if he ever gets that far). Your damage is increased by 100% at this time. Use Time Warp at this point as well. Don’t forget to Mage Ward to help absorb any damage if he’s able to cast his Sun Orb. Almost all of the damage in this fight is fire-based. Yes, that's a turtle standing on top of an angry pygmy. Such is the power of Polymorph that they never even noticed. These three-stacks of pygmies are a source of endless amusement, as you can imagine. Bring a mage friend! Make a turtle stack! You can tell when traps are going to explode by the pulsing animation – use Blink to stay one step ahead of them. You can’t Iceblock out of being thrown up on the pillar, but you can Iceblock or slowfall to avoid any falling damage. Don’t be caught standing in the Giant Sun Beam Of Doom, but be careful not to blink too close to party members. His Plague of Ages spreads via proximity. Use Time Warp on this fight during his Shadow phase to help end it quickly. Burn the phoenix! We just ignore the smaller adds. In the first phase (Lockjaw), be ready to Blink to stay out of whirlwinds or avoid crocs if necessary. AoE the crocs down, they’ll come snapping at whoever has the red arrow over their head. Especially if this is your healer, back them up with Blast Wave, Frost Nova, Dragon’s Breath, etc. A healer being gnawed on is a healer that can’t heal you or the tank. Time Warp can be used if available, but shouldn’t make a huge difference to your success. If the adds are kept under control, everything will be fine. You can wait before engaging Augh (and listen to him trash talking! “Who’s bad? Augh bad!”) so make sure to sit and eat to get back your health and mana. Augh himself doesn’t require anything special, just stay out of the way of his whirlwind. You’re on add duty for most of this fight, as Siamat himself becomes invulnerable. You’ll be attacking caster adds primarily; you can Counterspell some of their attacks. Be careful of hurricanes that can and will toss you up and even off the platform – if this happens you can try blinking quickly to land on the platform, but this will only work if you haven’t been tossed too far back (I haven’t tested this, and have never been thrown off so I don’t know how helpful slowfall is here). Blink can also help you navigate the platform if necessary. If you have Time Warp, use it once Siamat is vulnerable and burn him down. That’s it for those instances! Only two remaining – Shadowfang Keep and Heroic Deadmines. I’ll try to publish a post about them in the next day or so.